Hunter Fencing & Landscaping in Scone is fully licensed to build fences and gates under our Structural Landscaping licence. This means that you can relax, knowing that the design and construction of your fence are in capable hands. We provide a full range of fencing from aluminium and glass, © COLORBOND steel, timber and post and rail fences. 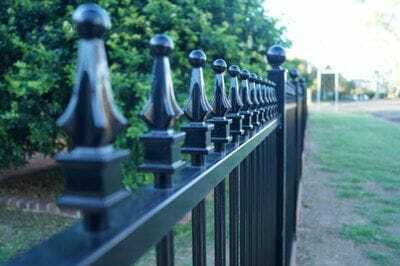 Whether you need a residential garden or backyard boundary fence, privacy screening, a pool fence or gate, Hunter Fencing & Landscaping only provides premium products and high quality workmanship. Unsightly tanks or pool equipment? Why not screen them with beautiful merbau? This durable hardwood is termite resistant and a good choice for bushfire prone areas. Don't just think about fencing as a boundary or privacy screen solution it can do so much more. Visit the Hunter Fencing & Landscaping Gallery for images of merbau screening. Aluminium pool fencing and aluminium pool gates are the most affordable option and popular with many residential, domestic and commercial clients. 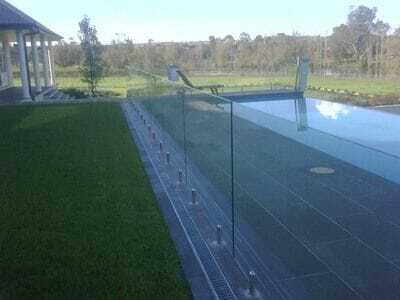 However, a glass pool fence gives a contemporary look and can really add a sense of space and style to a pool area. Hunter Fencing & Landscaping supplies a full range of industrial and commercial fencing products from chain wire to high security fences. Our online Gallery showcases a range of fences aluminium, glass, pool, timber, merbau screening, © COLORBOND steel, post and rail, commercial, domestic and residential fences and gates. Visit our Fencing Gallery now for ideas or call us to discuss! We are located in Scone and service Newcastle and the Upper Hunter area.